A friend of mine enthusiastically suggested, years ago, that I check out one of XPLANE‘s free VTS (Visual Thinking School) workshops. She’s a designer, and said she was extremely impressed with XPLANE’s methods of drawing your way through problems. Thing is, tickets sell out fast. Like, super fast. I mean, they’re free, but you have to claim a ticket and mostly by the time you read the email and click the button there are no tickets left. I did try a number of times to get a ticket, but what with having entered the bizarro world of early motherhood, even the one time I got one I had to cancel, having been unable to figure out how to get out of the house, sans kid, to be there. Fast forward 4(!) years to this September. I got an email for a VTS workshop about Biomimicry. Which sounded fascinating. I realized that I could probably make it, all things considered, so I hit the button and actually got a ticket. Everything worked out, logistically, and I went. It was kind of a big deal for me, not having been out of the house in a non-parenting, non-house-related-errand way in quite some time. The workshop was a lot of fun, and very educational. Everyone was very nice and did interesting things for a living. The expert on Biomimicry was an enthusiastic presenter of what the field of biomimicry is all about (to get an idea, check out asknature.org). We then got into small groups and did some very fast-paced problem-solving using VTS techniques. There was a lot going on, a lot of creativity and a lot of camaraderie. The folks from XPLANE and the Biomimicry expert wandered around to be available to help. 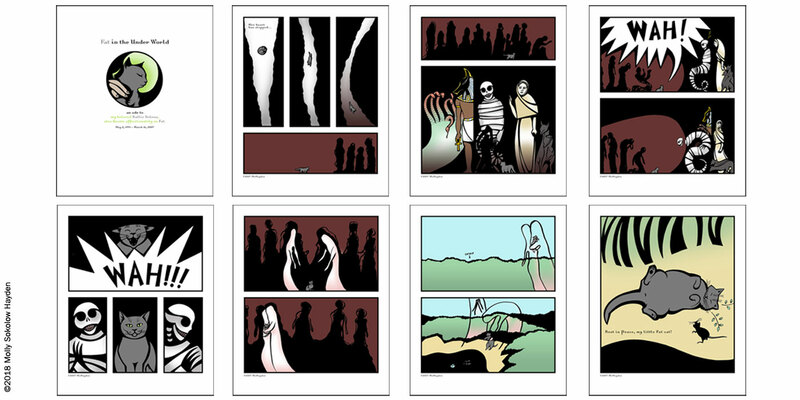 One of them found out I had an online-graphic novel and said they’d never done a VTS about graphic novels and would I be interested in helping to do one? Um…YEAH. It was kind of like a teenage fantasy where you get asked to dance by the really cool kid. And, sure, I have crippling stage fright but one of the benefits of age (for me) is a heightened ability to get over myself, in most cases, and not let the possibility of looking ridiculous stop me from trying to do something I really want to do. I worked with XPLANE to put the workshop together. I’ve worked with many, many people on many, many creative (and sometimes “creative”) projects over the years, and only once or twice have I had such a good time. The lovely people at XPLANE are master collaborators, and very smart, and very kind. Honestly, I didn’t know it could be like this, it was a bit mind-blowing. I was very nervous as the day approached, not because I didn’t think I knew what I was talking about—there are few subjects I have spent as much time on—but because I was worried that my body would try to convince my brain that I needed to flee the scene (a bear/tiger/giant snake is chasing you—run run run!). When this happens, my mind goes blank, and trying to remember anything is like forcing my body through a solid wall. I think this is what my therapist refers to as “social anxiety.” It is for this reason, and because I couldn’t quite believe that this was really happening that I told almost no one that I was doing this workshop. I figured I could talk about it afterwards, when I wasn’t seeing bears around every corner. So now I am doing that. 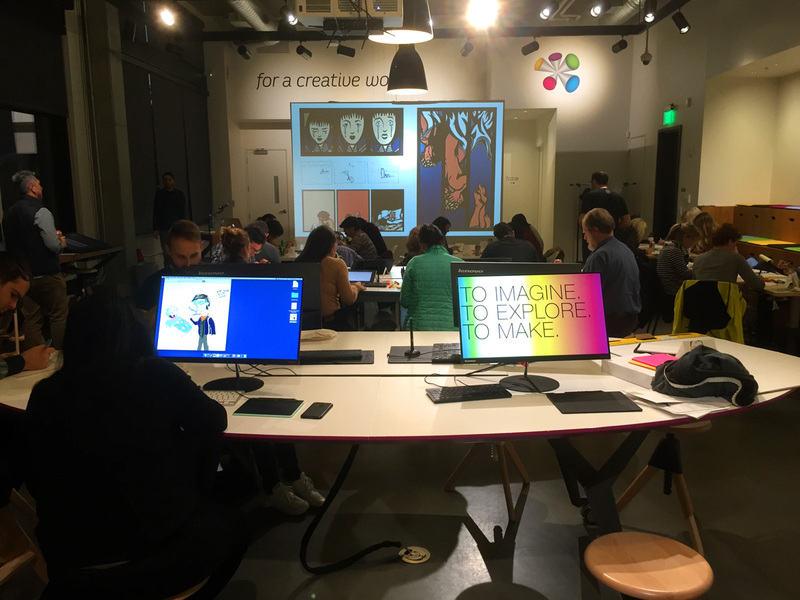 It was held at the Wacom Experience Center in downtown Portland (which is a bit of a candy shop for us graphic types, I can tell you). There was food and drink. Everyone got settled in and Tim May, the Creative Director at XPLANE introduced XPLANE and what they do, and what to expect from the workshop. 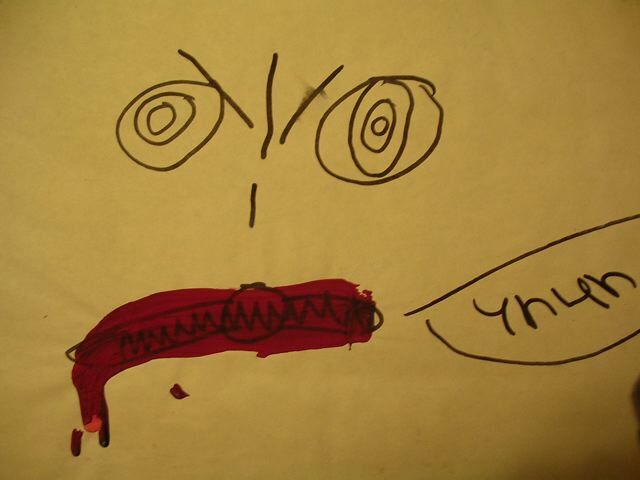 My friend Judy drew this when she was 6. On the back of the picture it reads “This is how Judy felt when Antone chose to play with Andra.” Kids don’t edit themselves. Judy didn’t stop and think, hey, maybe this drawing is a little excessive to describe what it felt like when my friend didn’t choose me to play with this one time. She drew what she actually felt like. The point of this workshop is to learn how to get back to that place, to draw how things actually feel, no matter how messy that is. Everyone lined their drawings up, grouping them loosely into types of emotion. They were GREAT drawings, with a huge range of emotions. 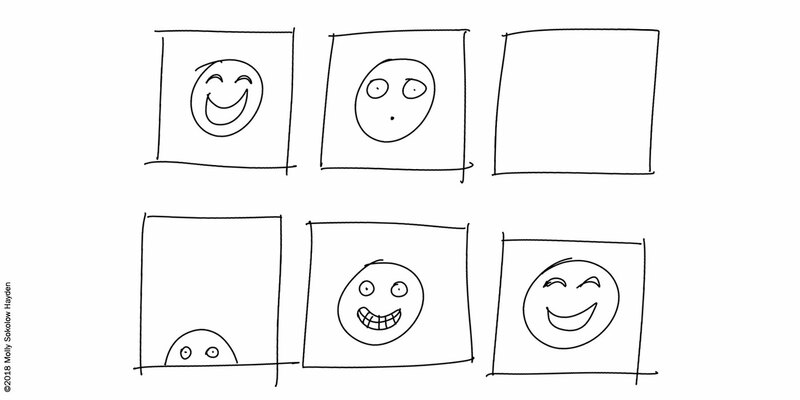 Some people drew faces, like I did, many drew objects (frayed wires, for instance) or even situations. Tim guided us through a discussion about these. Next I presented my own work, focusing on my experience with sequential art and also with drawing cathartic comics (what I think of as “sequential art therapy”). “I grew up in a house that had an entire room of comic books. My Dad had collected comics since he was a kid, everything from superheroes to Mad magazine to the underground comics of the late 60s and early 70s. I started looking at and reading them when I was about 4, and since I have always liked drawing, it has always felt natural for me to draw stories as a series of pictures. 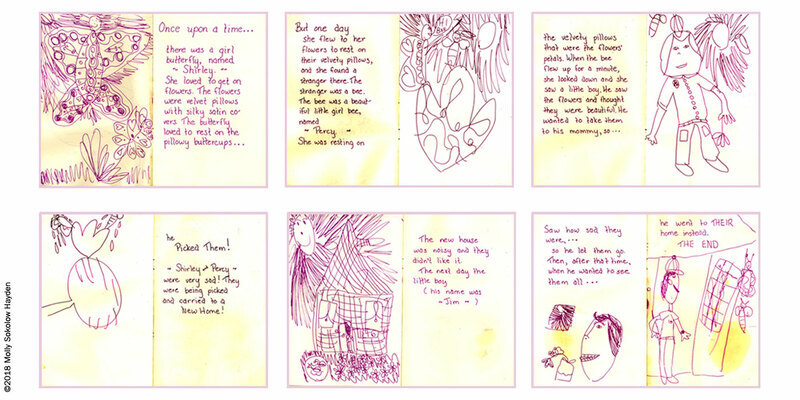 Here’s a story I drew when I was about 5 1/2, and some nice adult wrote it out for me to make into a book. I continued to draw and make comics as I got older, about anything that I happened to be going through. These are a couple of my teenage drama comics. It was in college that I stopped drawing regularly, which is odd, because I went to an Art school. But I was studying Design, and while we drew type—computers didn’t really come in until I’d been there a few years—we were learning lots of other ways to make images. To keep my hand in while I was slogging away at desktop publishing jobs during the 1990s, I created a huge project for myself, which is apropos to this workshop. 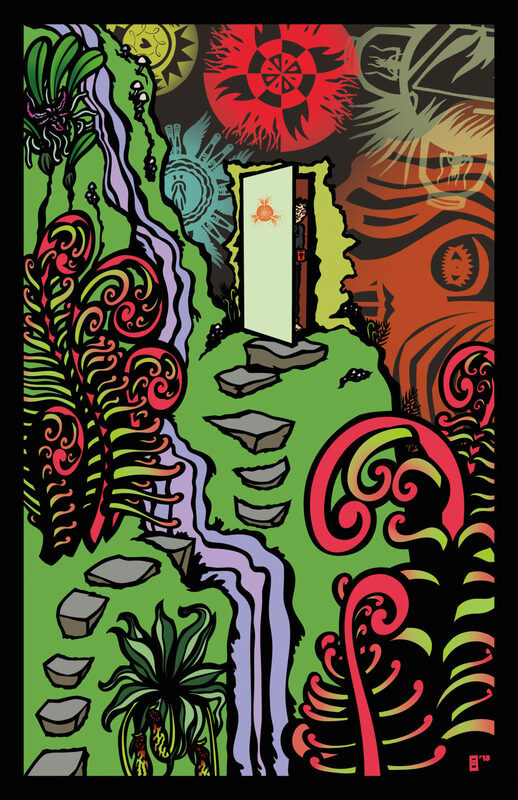 I drew a tarot deck of my own devising. I wanted to figure out my own archetypes. 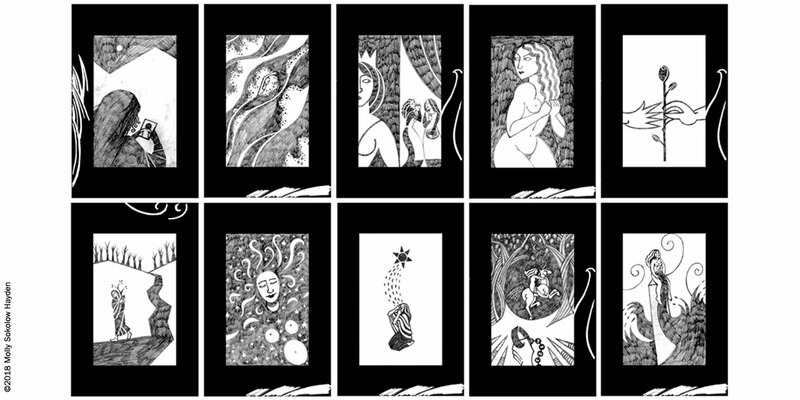 This is still, in my opinion, sequential art—each card is meant to express one emotional situation, but they also each fit into different patterns within the deck (the final deck had 72 cards). Top row: Memory, Struggle, the Queen, Secrecy, Romance. Second row: Leaving, Joy, Grief, the Unicorn, Creation. Aside from the cards, I really didn’t draw for almost 10 years, until my life started falling apart. My husband and I wanted kids, but found that we couldn’t have them, and so we entered what I think of as the many hells of infertility. Things got very dark for me. 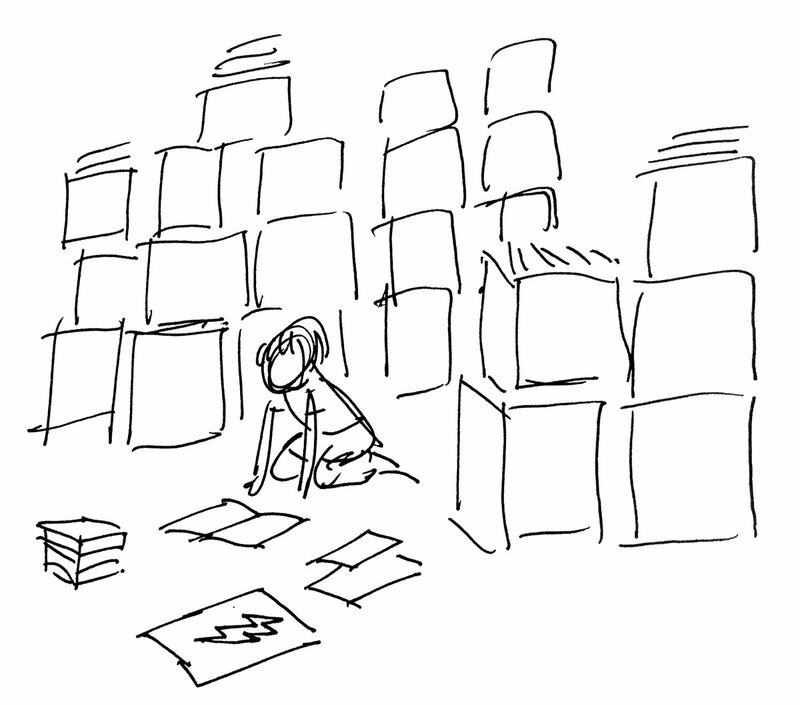 At some point, I looked around for anything that still made me happy, and what made me happy was drawing, and comics, and stories. The spark that got me back not only into drawing, but into drawing as a way to express specific emotions, was when my cat, Fat, died. Fat was 17 when she died, and I had lived with her more consecutive years than I had with any human being. When she died, I was a total mess. Finally, I sat down and drew a comic about her trip to the underworld. I felt a lot better, afterwards, because I was able to say, somehow, things I couldn’t say in words. This comic led directly to me drawing more and more as a type of therapy, and to the two projects that I’m still working on that are about going through infertility. 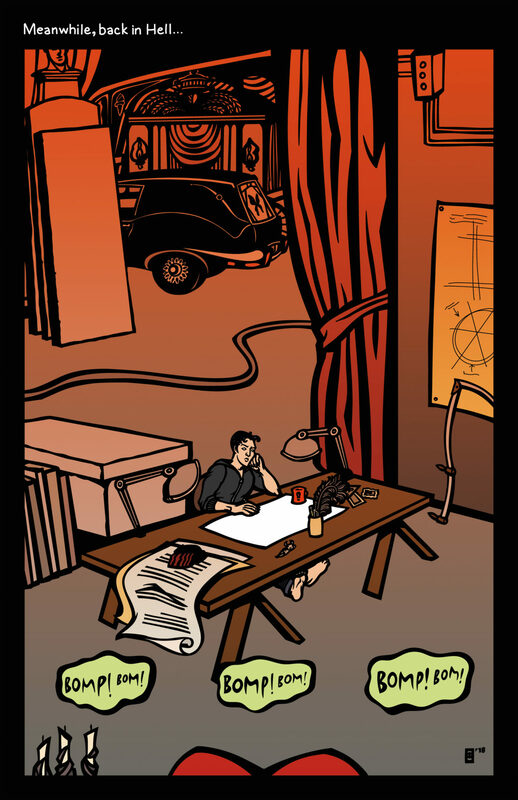 One is an online graphic novel, called the Lay of the Lacrymer. It’s set in the 1880s, and is about a woman named Mary, who is married to Poseidon, and whose daughter has died. Mary has to find her daughter’s soul, and she has 40 days to do it. There are mermaids, and gods and goddesses, from all over and a magic ship, and everything in this story is linked to an actual experience I’ve had. (I took a workshop on how to write your life as a fairytale, many years ago, and that was very helpful in freeing me to get back to my 6-year-old self, because when you write or draw your story like a fairytale, you can make things look how they feel). This project has been the most fun I have ever had. The second project is a book much more clearly about my infertility experience. Its called “Barren”, and I’m still working on it. It’s going to include resources about dealing with infertility, as well as what actually happened to me. Here are two images from the book that were included in an art show about pregnancy loss, called “Bearing Witness.” The show was amazing. Everyone thought it would be really depressing, but it was fantastic. Looking at all of this creative work about our losses somehow made everyone feel LIGHT. We had survived this terrible thing. The opening felt like the first day of spring. A few years later there was a documentary made about it, and specifically about the role that presenting art publicly has in art therapy. I got to be in that, and that was also a profoundly cathartic experience. It was magical. Then my Dad died. And thank goodness I had a way to deal with that grief. He and I had shared a love of comics, which really no one else in my family had. I’m not sure how I would have managed to get through that first year after he died if I hadn’t been able to draw a piece about what he meant to me. It gave me a sense of closure, and of being able to show the arc of our relationship, that helped me move forward. 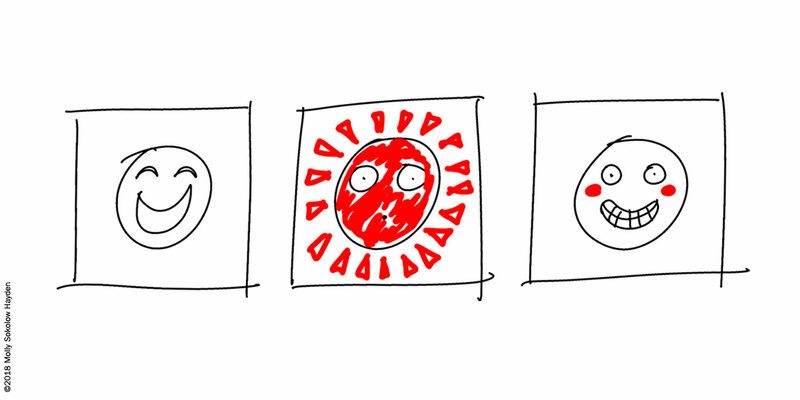 The first frame shows how I felt when I got asked to do this workshop—SO HAPPY! The second frame is when I remembered that I have crippling stage fright. The third frame is now—I’m at the workshop, freaked out but excited. We showed examples of story-telling in three frames and talked about using the frames to expand stories across time and space, about repetition of characters, and shifting focus. Everyone got to work on drawing three frames, using individual index cards for reasons that will be clear as we move on. After this exercise, anyone who wanted to share theirs could, and we discussed generally how it had gone and how they felt about it. There was a wide range of stories, from short commentaries on something that happened during the day, to the progression of their lives over years. Good, good stuff. I just used color to highlight my feelings of anxiety. Other people used it as a character in and of itself, to highlight a variety of emotions, and to create rich environments for their stories. Next, we talked about the narrative arc, and how the difference between just talking about your life and telling a story that will speak to others involves something happening to your character which pushes them out of their ordinary life. Tim pointed out that this is why so many movie trailers start, “In a world where (things are not as they usually are)…” Your character then has to struggle with the changes that this transformative experience has brought, either successfully integrating them into their ordinary lives, or failing to do so. We also talked about adding even more frames, and how you can accentuate fast and slow actions, expand the sense of environment, and generally make your story stronger. 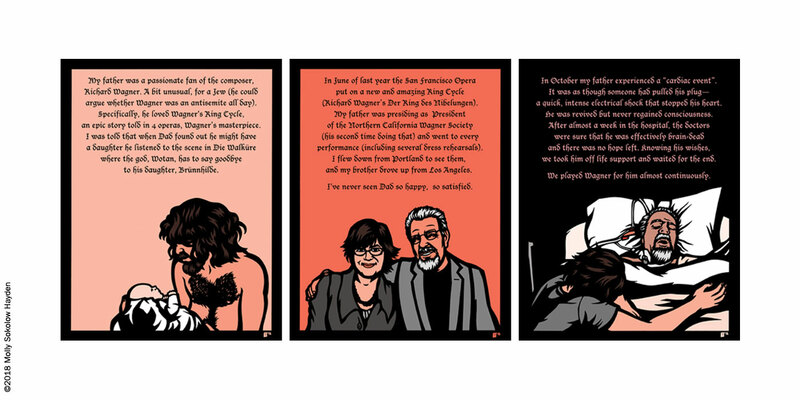 We asked everyone to expand their stories to six frames, if they wanted. 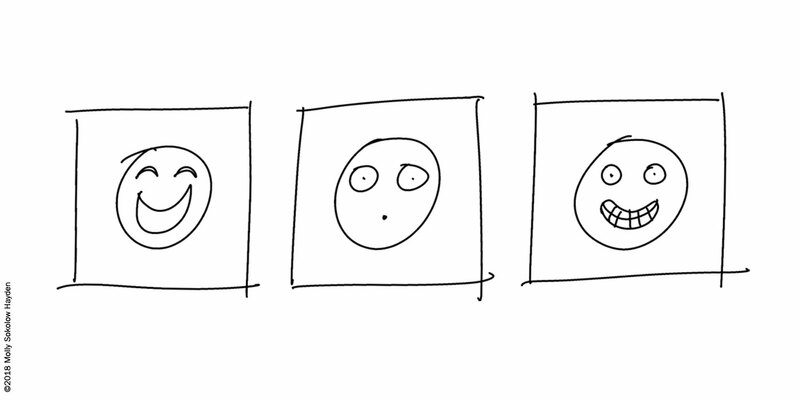 Here’s where having each drawing on an index card was helpful, as they could shift them around rather than having to re-draw the earlier frames. 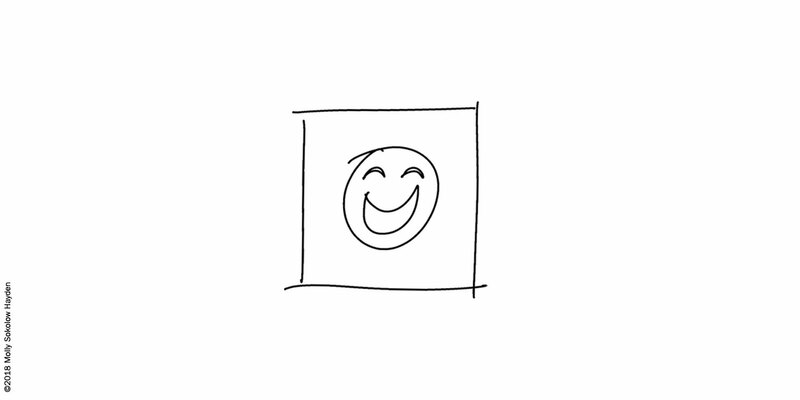 I did mine very simply, adding in a frame to highlight my freaked-out reaction to my stage fright, which was to be in denial about it, then to slowly start to face up to it, then, in the end, get back to being totally happy to have the experience of doing the workshop. By this time, everyone’s drawings were turning into sophisticated stories, regardless of how simply they were drawn. Some were about grief, some were about the frustrations (or joys) of their daily life. Some were about significant memories. Several were about break-ups, and in one someone turned into a cat. The last exercise was about adding text. We showed a lot of examples of comics with text. Some read almost as well without the text, with the words helping to define and punctuate the action, and some used words as a crucial part of the story. Everyone who wanted to added text (I’m afraid I didn’t do this one, because I was too busy talking to all of the interesting people at the workshop). Finally, everyone who wanted to share their work put up their pieces on the wall so we could all see them. There was a lot of very evolved story-telling going on, all the examples felt complete, and rich. It was the most fun part of the evening for me, because other people’s stories are always not only surprising but, as I mentioned before, illuminating. Abel, Jessica and Madden, Matt. 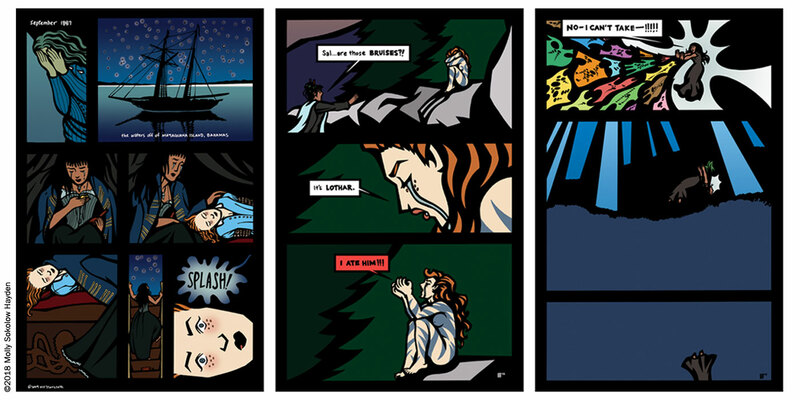 Drawing Words & Writing Pictures: A Definitive Course from Concept to Comic in 15 Lessons. New York, London: First Second, 2008. Arnoldi, Katherine. Amazing “True” Stories of a Teenage Single Mom. New York: Hyperion, 1998. Barry, Lynda. The Greatest of Marlys. Montreal: Drawn & Quarterly, 2016. Barry, Lynda. One! Hundred! Demons! Seattle: Sasquatch Books, 2002. Drooker, Eric. Blood Song: A Silent Ballad. San Diego, New York, London: Harcourt Inc., 2002. Eisner, Will. Comics & Sequential Art. Florida: Poorhouse Press, 1985. Forney, Ellen. Marbles: Mania, Depression, Michelangelo & Me. New York: Gotham Books, 2012. Mignola, Mike. Hellboy. Milwaukie, OR: Dark Horse Comics, Inc. 2008. Thompson, Craig. Blankets. Georgia: Top Shelf Productions, 2003. Lynda Barry’s book 100! Hundred! Demons! was a direct inspiration for both of my projects about infertility, and, frankly, for how to deal with life, period. It is also extremely funny (and dark). Anything by Lynda Barry is going to be good, but her books about how to draw and write (What It Is and Picture This: The Near-Sighted Monkey Book) may be particularly useful to anyone trying to get their own stories down on paper. 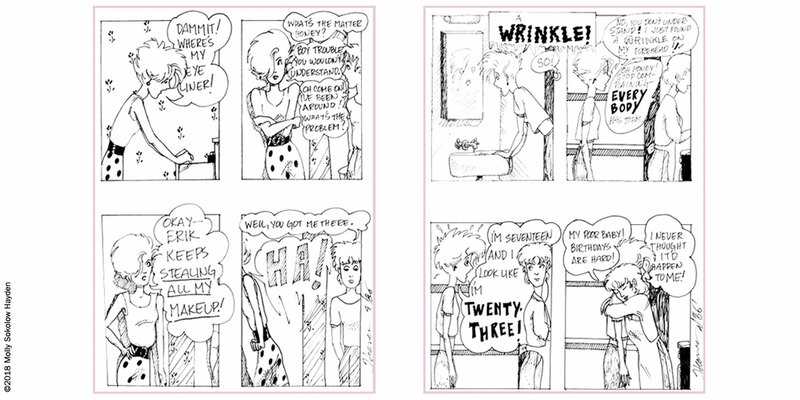 Ellen Forney’s books Marbles: Mania, Depression, Michelangelo & Me and Rock Steady: Brilliant Advice from My Bi-Polar Life are fantastic examples of “graphic medicine”. Her book Monkey Food: The Complete “I Was Seven in ’75” Collection is one of my favorite auto-biographical pieces ever. All of her creations are beautiful, though, and she is also an amazing teacher. Will Eisner is one of the masters (if not THE master) of sequential art–read him! 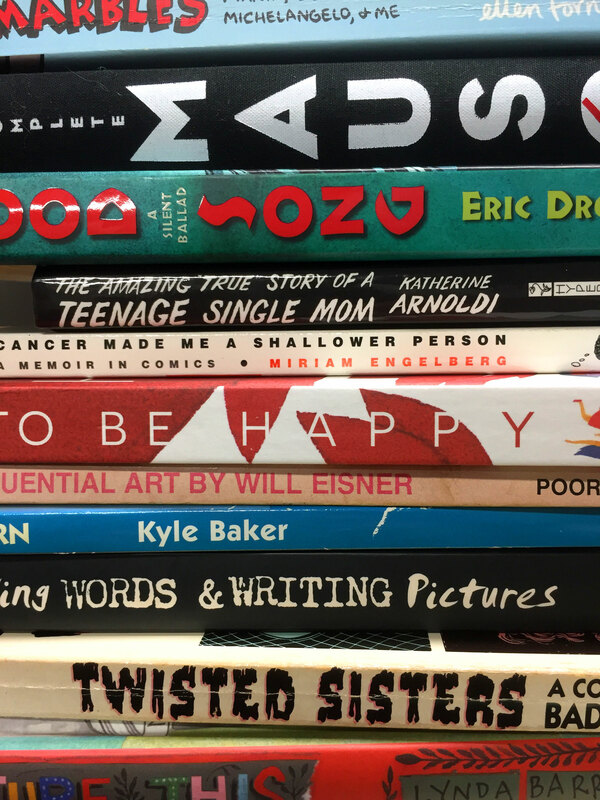 Again, check out the Graphic Medicine site for more reading lists, or just go to your local comic shop and peruse things. The Multnomah County Library also has pretty much any comic you’d want to read, in multiple formats (digital as well), they are a treasure trove.